Near Vulture Peak, western Maricopa County, Arizona, USA. Aug. 21, 2016. 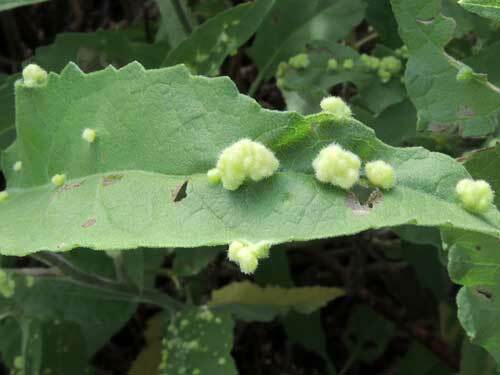 Numerous such galls were found on new growth of Canyon Ragweed (Ambrosia ambrosioides). Hundreds of species of gall mites (Arachnids) are found on a vast variety of plants. They are nearly microscopic, yet their feeding and secretions can cause very conspicuous swellings, blemishes, or witches brooms. Some of them are pests of crops and ornamentals. Canyon Ragweeds are often found that have numerous pale green warts on the leaf surface. Several species of eriophyid gall mites belonging to the genus Aceria have been recorded on ragweeds. The mites feed on the plant tissue from the inside of the hollow blisters that are formed by the plant in response to secretions and irritations of the mites. Breaking open the galls will reveal the mites visible with a 20x magnifier.